For many motorcycle riders, their motorcycles are not just a mode of transportation, but a way of life. To these enthusiasts, motorcycling offers an attractive lifestyle, a fun hobby or a more economical, environmentally friendly and quicker way to get through traffic. However, accidents involving motorcycles happen frequently, and can be physically, financially, and emotionally devastating. If you have been injured in a motorcycle crash, you are not alone. Every year, more than 88,000 motorcycle riders are injured, and 4,000-5,000 lose their lives in fatal accidents. If you or a loved one have been involved in a motorcycle accident, our experienced team of motorcycle accident attorneys can guide you through the complex legal process and help you receive fair and full compensation for your losses. Motorcycle riders must deal with many hazards on the road. Here are some of the main causes of motorcycle accidents, and the injuries they cause. Driving under the influence: According to the Insurance Information Institute (III), 30% of motorcycle accident fatalities involved one of the drivers being impaired by alcohol. 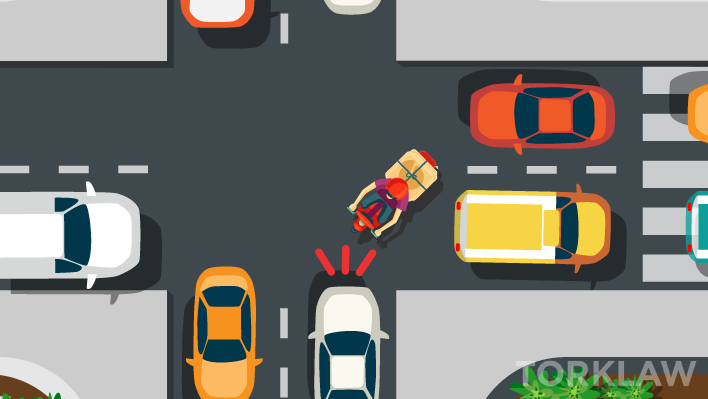 Unsafe turns: The National Highway Traffic Safety Administration found that 41% of fatal motorcycle crashes occur when the driver of another vehicle strikes an oncoming motorcyclist while making a left turn or U-turn. Dangerous lane changes: California recently became the first state to allow motorcycles to ride between two lanes. This practice is known as lane splitting, and motorcyclists are allowed to do it, as long as they do it safely. 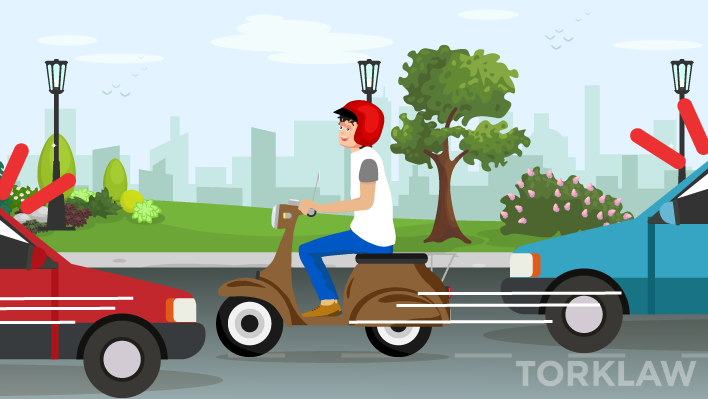 In fact, in stop-and-go traffic, lane splitting is safer for motorcycles, because sudden stops are another frequent cause of motorcycle collisions, causing the motorcyclist to either be rear-ended, or collide with another vehicle’s back end. Distracted driving: Distracted drivers are one of the greatest hazards to road safety in the United States. The NHTSA reported that more than 3400 fatalities and 390,000 injuries were caused by texting while driving. Motorcyclists, because of their size and agility, are particularly vulnerable to drivers who are not paying attention. Check out our latest motorcycle news & info here! Motorcyclists, even when observing safe riding practices and wearing safety gear such as helmets, have minimal protection when they collide with a larger vehicle, in which occupants are protected by their enclosed cabin, airbags, seat belts, and other safety features. When a vehicle collides with a motorcycle, most often the motorcyclist suffers catastrophic injuries and must endure a lengthy recovery process. Here are the five most common types of injuries motorcycle accident victims suffer. Head trauma: When a motorcyclist strikes his or her head against the pavement or against another vehicle during a collision, he or she is very likely to suffer a brain injury, especially if not protected by a properly fitting, good quality helmet. Traumatic brain injuries, when not fatal, can lead to long-term disabilities. Spinal cord trauma: When a rider is thrown from a motorcycle and onto the pavement, it may fracture the back or injure the spinal cord, which could lead to partial or total paralysis. Victims may never recover from some of these injuries and may require lifelong treatment and ongoing care. Bone fractures: Bone fractures can require lengthy and extensive physical therapy to regain strength, mobility and function. Rehabilitation costs may not be fully covered by health insurance plans, and victims may need to pay for these treatments out of pocket. Road rash: When a motorcyclist slides across the pavement after a crash, the friction between the rider’s body and the rough pavement causes burn-like injuries to the skin. In severe road rash cases, the nerves may be damaged. Protective gear such as kneepads, gloves, and jackets may help guard against these injuries. Facial injuries: Injuries to the face including the nose and eyes are extremely common in motorcycle accidents. Some eye injuries may result in loss of vision. It is important for motorcyclists to protect their eyes with goggles or helmets with face shields. Make sure the accident scene is safe. If possible, move your motorcycle off the roadway so it’s not a safety hazard for other vehicles. Check for injuries, and get immediate medical treatment if necessary. Check yourself, your passengers and others involved for injuries. Immediately call 911 if anyone is injured. Take photos and videos of the accident scene. When you are in a safe position, try to take photos and videos of the accident site from a variety of angles, and capture details including the damage to your motorcycle, the position of the vehicles involved in the collision, the roadway conditions, and the surrounding environment. Gather as much information as possible. If the police responded to the accident, they will file an official report detailing all the facts of the case and the identities of the parties involved. Make sure you contribute to this report and obtain a copy of it for your own records. This report should be available at the police department a few days after the incident. Obtain contact information, including names, phone numbers and email addresses for all involved parties and potential witnesses. Take down the vehicle information for all vehicles involved in the crash; including the make and model of the vehicles, vehicle identification numbers (VIN) and license plate numbers. Be sure you take the other party’s insurance information, which they are required by law to provide. Contact a motorcycle accident lawyer. A knowledgeable accident lawyer who has handled similar cases will be able to fight for your rights and help ensure that you receive maximum compensation for the injuries, damages and losses you have sustained. Proving liability in a motorcycle accident case can be a challenging and intimidating proposition. You need a knowledgeable and resourceful motorcycle attorney on your side. The attorneys at TorkLaw have a stellar record of accomplishment when it comes to helping injured clients secure maximum compensation for their losses. Our lawyers are skilled negotiators and trial attorneys who are ready to do what it takes and go the extra mile to help clients. Please contact us today for a free and comprehensive consultation.